At brick&mobile we take our customer support very seriously. Our support team goes above and beyond the call of duty to ensure your satisfaction. Available 24/7 our team is dedicated to your success, and we’re always available to answer your questions in a friendly and timely manner. You will never spend days waiting around for an answer to your technical issues. Our support team is dedicated to your success, and will go the extra mile to ensure your satisfaction. Easy to follow step by step training videos will help walk you every step of our system. 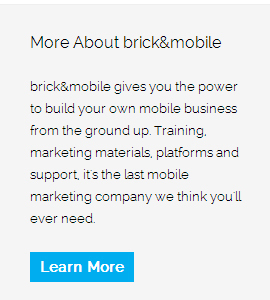 Master the art of building, designing and selling mobile websites in no time. Hundreds of articles with step by step tutorials which will walk you through commonly asked questions and features. Our knowledge base will make it easy for you to find answers fast. Your success us our success. Our team of Mobile Marketing Experts are with you every step of the way, providing ongoing support and webinar to help grow your business. Whether you’re looking for an answer to a commonly asked question or just wanted to bounce some ideas off of us for a potential campaign or sale opportunity, you can rest assured you have a team of mobile marketing professionals standing by your side helping you along the way.